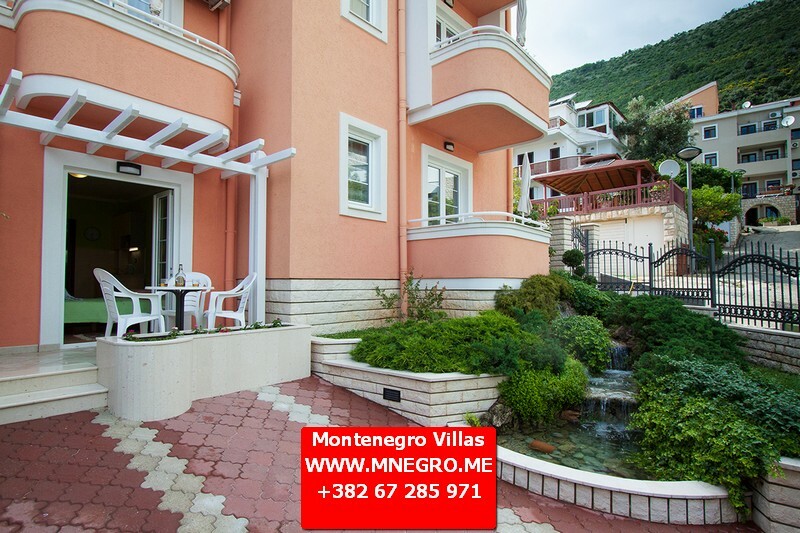 ME137 Villa Green Oasis MONTENEGRO 4**** Villa Budva Riviera | MONTENEGRO Villas 2019 rental UNIQUE Vacation for You !!! 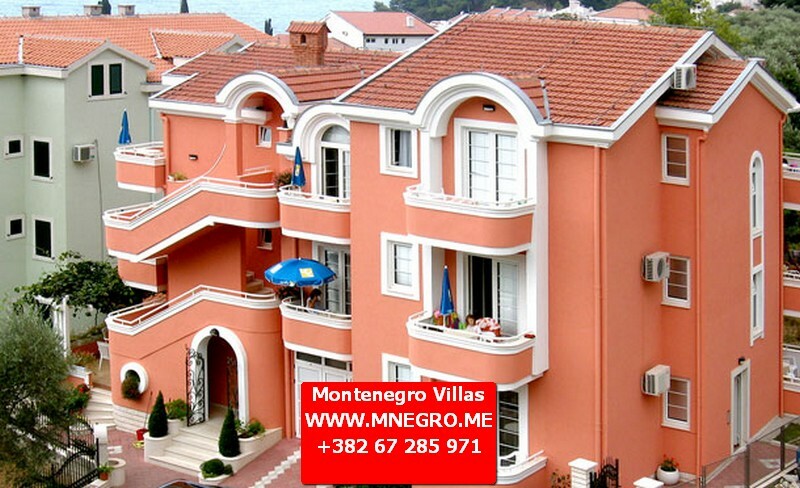 ME137 Villa Green Oasis MONTENEGRO 4**** Villa Budva Riviera – MONTENEGRO Villas 2019 rental UNIQUE Vacation for You !!! 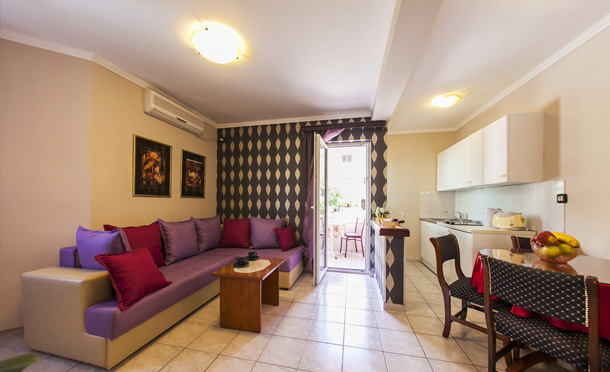 Romantic Villa 4**** Green Oasis Petrovac is situated only 250 – 300 meters from the main beach, in the most peaceful part of the town. 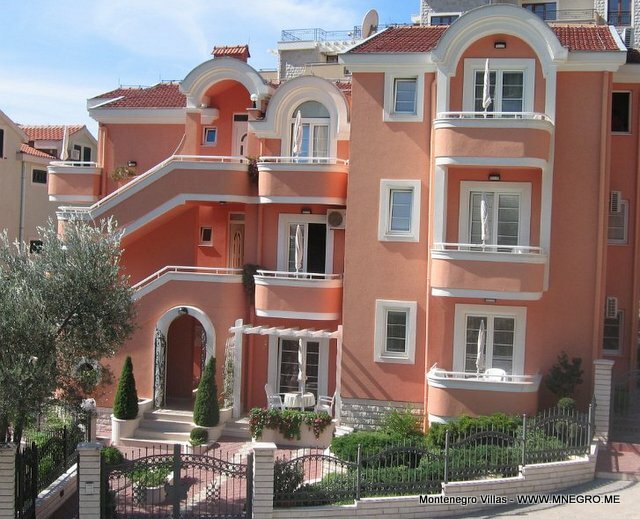 Green Oasis Petrovac both interior and exterior are sensational, this luxurious 4 star family run Vila has a Mediterranean feel to it. Vila prides itself with 2-bed, 4-bed and 5-bed modern apartments. Every apartment has a fully equipped kitchen with the toasters, coffee makers etc. Bathrooms have shower cubicles or baths with hairdryers. 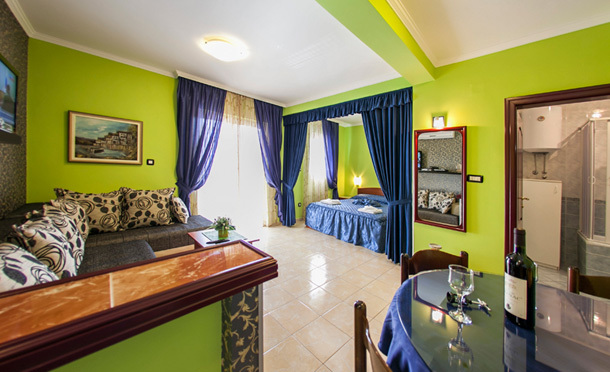 All the apartments come with balconies with the parasols where you can enjoy the see and the aroma of olive trees. The swimming pool is placed in the spacious, beautifully landscaped garden with splendid range of plants. There is also a seating area from where you can see the water fountain and enjoy the garden. 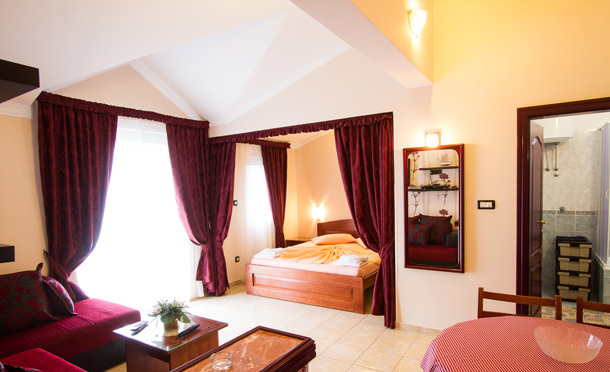 We are offering an ideal, relaxing holiday to our guests. The service and hospitality we provide is exceptional and we try to give you the holiday which you really deserve. 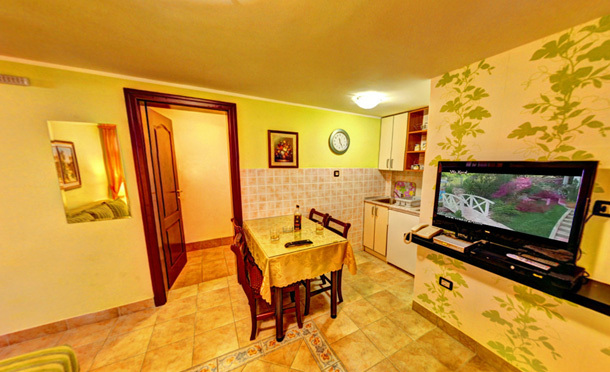 PCs with the internet access and the laundry service available for guests of Vila. Vila offers car rental to its guests. 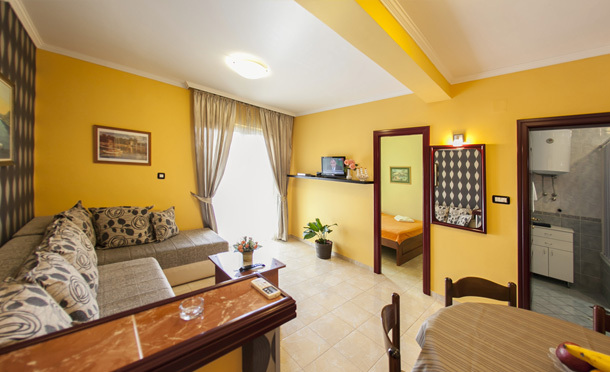 The apartments are air-conditioned, have cable TV, DVD players, telephones, safes and daily chambermaid service. as well as the balcony with the parasol. The bedroom has a king size bed, big wardrobe, personal safe and the side table. In the living area there is a two seater sofa and an arm chair which can be used as a single bed if needed, as well as a dinning table with chairs. 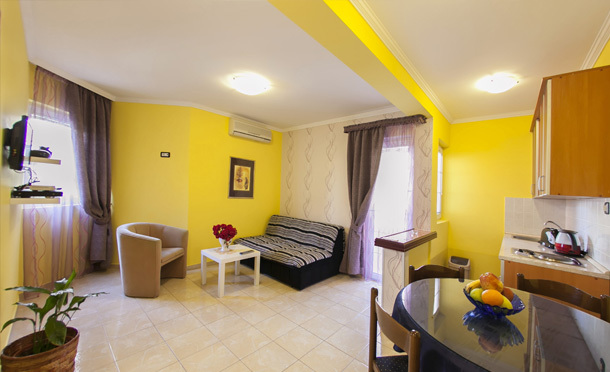 This apartment is air conditioned and has a TV with the DVD player with the cable TV, telephone and the personal safe. If needed, cot for children can also be fitted in the room. The kitchen is well equipped and there is also crockery and cutlery available for use. enjoy the aroma of olive and pine trees. 24 hours daily professional chamber maid service and the internet access are available to our guests. This 4 bed apartment has a living room, bedroom, kitchen, bathroom (with the bath) as well as the balcony with the parasol. 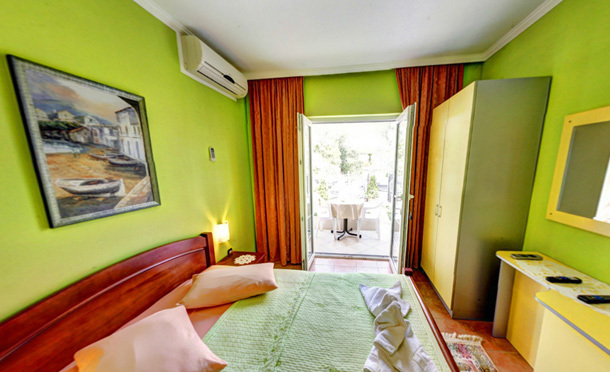 The bedroom has a king size bed, big wardrobe with personal safe and the side table. In the living area there is a two seater sofa which is using for two persons bed, angular sofa which can be used for two persons bed, an arm chair for a single bed if needed, as well as a dining table with chairs. There is a table with chairs on the balcony together with the parasol which will enable you to enjoy the aroma of olive and pine trees.